A magnificent recent work, an outstanding interpretation, a faultless collaboration. Fortunate indeed are the composers to whom, as in this case, the chance is offered for their work to be recognised as transcending all boundaries. In this country we are still a long way from such possibilities! Francis Pott, a composer and pianist born in 1957, composed this commissioned work for the Silver Jubilee of the Vasari Singers under Jeremy Backhouse, completing it in 2006. [Actually 2005.] It grew into a multi-faceted and complex work, for which he devised the structure himself, spending much time assembling his libretto from different sources: the Psalms, Holy Scripture, poems and prose by Thomas Traherne, William Blake, Wilfred Owen, Isaac Rosenberg, René Arcos and Odysseus Elytis, and then finally words from The Cloud of Unknowing, an anonymous mystical 14th-century text on the unknowable nature of God. This gave the complete work its title. This composition originates as the response of a person still capable of compassion to the stark reality of the tragedy at the school in Beslan in September 2004, and to the wider cruelty which, since the start of the 21st century, our world has vindicated for itself on new pretexts (Bush’s ‘terrrrrism’). The voices of the choir become the lament of those frantic mothers, expanding into an outcry for peace in this world – a world over which a cloud of unknowing has been laid and which now mourns to itself. The Prologue, the introductory organ solo, already makes plain that this is a large-scale composition: sombre, harmonically tortuous, inconsolable, it gives rise to the no less sombre entry of the chorus. Just as insistent are the interventions of the tenor soloist, persuasively projected with great vocal presence and expressive power, which portray human conscience. Moreover, all the interpreters are outstanding; Jeremy Filsell at the organ, the Vasari Singers under Jeremy Backhouse (a model ensemble within the British choral tradition), and James Gilchrist, the soloist. The recording too is immaculate. The work closes – conventionally before an Amen – with the plea of Jesus on the Cross: ‘My God, my God, why hast Thou forsaken me?’, and in listening one cannot help thinking of Benjamin Britten’s War Requiem. In itself this testifies to the intensity and emotional power of the composition. It must be counted among the major works of the beginning of the 21st century, amounting as it does to a mirror image of the tragedy experienced by our times. Its dedication includes the following inscription: ‘In memoriam: Margaret Hassan and all innocent lives lost in or beyond Iraq’. Margaret Hassan was the care worker murdered in Iraq in November 2004 by persons unknown; her senseless death had triggered a powerful sense of shock. Such a dedication in itself tells us clearly enough that Pott’s outcry is an uncompromising indictment of our cruel, mad world, as he himself writes in the booklet: ‘…the sentiment behind it [is] one of personal revulsion at the hollow eulogies of western leaders mired in blood no less than those they would condemn’. Francis Pott is a humanist whose deeply compelling message must be heard. Francis Pott: The Cloud of Unknowing – Church Music Quarterly - An immense performance of an immense work. The Cloud of Unknowing is a collection of texts featuring cross references of texts from Biblical and poetic sources. It was originally just the setting of Psalm 23 (The Lord is my Shepherd) that the extraordinary Vasari Singers commissioned, but this eventually grew into this 90 minute tour-de-force. It also is a vessel which in essence forms a questioning of Pott’s faith and ability to believe in his faith. In his own words:’…the music confronts a mid-life ebbing of faith. Scientific rationalism shrinks our place in the scheme of things…while the state of the world suggests a suffering God, powerless to intervene in any human misery’. Like all great composers, Pott turns to music to try and create some sort of response. To put this into perspective, two events that surround the history of this powerful and emotional work are the tragedy of Beslan in 2004 (after which Pott wrote the first music) and the 7 July bombings in London, which occurred the day after the first performance. The Vasari Singers are excellent – there is a vast amount of text to be sung and although it is occasionally lost, the feeling that is conveyed is always obvious and performed with unfailing commitment. Jeremy Filsell is superb in his playing, producing a constantly exhilarating sound from the remarkable Marcussen organ. James Gilchrist is a tenor with a remarkable ability to sing with clarity and near effortlessness. In his 50th year, Francis Pott has given us a work of huge power and individuality. This is an immense performance of an immense work. Francis Pott: The Cloud of Unknowing – MusicWeb International - The performance is stunning. This substantial piece was composed by British composer Francis Pott. It was written to celebrate 25 years of the Vasari Singers under the leadership of Jeremy Backhouse, with funding from the PRS Foundation. Pott is respected as something of a leader in the contemporary choral music scene, and has achieved widespread critical acclaim. Taking its name from a fourteenth century anonymous text, this new oratorio sends out a strong humanitarian message, a plea for peace in a world of conflict and suffering. Central to the work, Pott’s setting of Psalm 23 was the first of the twenty nine tracks that make up The Cloud of Unknowing. It is a response to the Beslan tragedy in September 2004. The setting is for women’s voices only, echoing contemporary TV footage of mothers in distress. The work opens with an organ prologue which is dark, desolate and searching, reminiscent perhaps of Messiaen’s work. The vocal entry continues the sombre mood, building towards the first of many tenor solos (track 4), all of which are sung skilfully and with musical sensitivity by James Gilchrist. The role of the soloist is to take on the voice of the human conscience, struggling against war. This is intense music, indelibly connected with political issues, and their effect on humanity. It also represents a crisis of faith within the composer, unsurprising in a world where so much suffering occurs. The name of the Vasari Singers has been connected with excellence in performance, and this recording is no different. The singing is outstanding throughout, and the organ playing has a symphonic feel, which lends grandeur and a sense of enormity to the proceedings. Pott’s compositional style is an extension of British twentieth century tradition, having resonances in style with Walton and Elgar. One cannot help but think of Britten’s War Requiem as a precursor to this work. Using texts from a variety of sources, including Blake, the Psalms and war poets, the message is clear and moving, at the very least stirring the listener into thought and perhaps even as far as action. This is intoxicating and dramatic music with an inner strength and determined convictions. The performance here is stunning, and the production values match. This recording featured in MusicWeb’s Recordings of the Year for 2007, and deservedly so. Francis Pott: The Cloud of Unknowing – Organists Review - Editor’s Choice – a riveting and outstanding performance. Pairing my favourite adult choir with the excellent soloists of organist Jeremy Filsell and tenor James Gilchrist, is an instant winner. Furthermore, to combine all three with Pott’s exciting oratorio is a must, and I wholeheartedly recommend this recording of The Cloud of Unknowing, an interesting and powerful response to the wars and atrocities of the past five years and specifically to the 7 July bombings in London. Not having heard any of Pott’s compositions before, I was immediately won over by his 80-minute work. The drama this challenging piece demands is captured by the brilliance of the choir’s performance and Filsell copes with an immensely difficult organ part bringing the work to life with some wonderful registrations. The text is drawn from a number of sources: The Psalms, Wilfred Owen, Isaac Rosenberg, Traherne and the modern Greek poet Odysseus Elytis, creating a powerful voice to demonstrate the conflict and instability of an uneasy world. The emotion is perceptively displayed without any sentimentalism by the superb Vasari Singers, who treat the quieter sections with complete sensitivity. There are two CDs and the second opens with the brilliant James Gilchrist setting the scene and ambience as he skilfully interweaves with the choir. The wonderful, evocative ending is beautifully executed with a hushed reverence as the choir fades away to leave the organ on its own for a few seconds and then cleverly, the recording continues with silence for a little while longer to capture the moment and emphasise the experience. A riveting and outstanding performance and excellent recording. Francis Pott: The Cloud of Unknowing – Musical Opinion - A performance of compelling artistry. Francis Pott’s large-scale “Humanist Requiem” as it may be termed, of 2005, for Tenor, Chorus and Organ, fulfilled a commission marking the Vasari Singers’ quarter-century, combining texts articulating the composer’s sincerity in conveying his ‘personal revulsion at the hollow eulogies of Western leaders mired in blood no less than those they would condemn’ relative to those on-going conflicts threatening the world in the 21st Century’s first decade. Such sentiments resonate strongly with many people and Pott’s deeply felt, directly expressed score has considerable emotional impact. The juxtaposition of liturgical and non-liturgical texts reflects such examples as Vaughan Williams’ Dona Nobis Pacem and Britten’s War Requiem. Musically, Pott’s language will not offend either composer’s admirers, nor those familiar with the language of Maunder, Stainer, Parry, Stanford, Elgar or Ireland, for his work has clearly been irrigated from their examples, subsumed into a fluent, immediately expressive style. The composer could hardly wish for a better performance than this. The Vasari Singers’ quality and commitment is of the highest, with James Gilchrist an unfailingly outstanding soloist. Jeremy Filsell accompanies superbly, and much praise is due to Jeremy Backhouse, who secures a performance of compelling artistry. The recording quality is admirable. The composer provides detailed notes. Francis Pott: The Cloud of Unknowing – The Organ - Contemporary choral writing and performance of the highest order. This is a monumental work in two senses: firstly, it is on a large, oratorio scale; and secondly it is a memento or a challenging of a ‘mid-life ebbing of faith’ and the darker side of humanity, as well as the selfless sacrifice often made in times of war or other conflict. The composer writes poignantly and movingly about the genesis of the work. The close relationship with the Vasari Singers has also clearly influenced the creative process, the result being a superb piece of modern choral writing, both challenging and accessible at the same time. The interaction between the tenor soloist, the choir and the organ is especially effective, and helps to provide a momentum through the work. James Gilchrist is excellent, as is Jeremy Filsell, the whole being superbly directed by Jeremy Backhouse, who confirms his reputation with this recording. It would be inappropriate to single out any particular part of The Cloud, for the work stands as a whole. This is simply contemporary choral writing and performance of the highest order. I strongly recommend the CD and hope that we hear the work ‘in the flesh’ many times in the future. 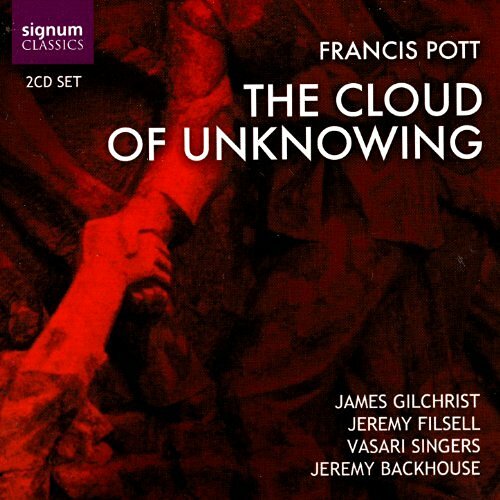 Francis Pott: The Cloud of Unknowing – International Record Review - A disc of distinction. This recording constitutes a zeroing-in on fundamental principles for Francis Pott, a reaffirmation of some kind of other-worldly scheme, even if it isn’t turning out to be the brand of religious faith he once ardently subscribed to. Perhaps, as Pott proposes in his brimful insert notes, an alternative higher truth is to be found in the notion of ‘a Crucifixion perpetually re-enacted within the atrocities of successive ages’. Psalm 23 triggers in the composer an allegorical affinity for one particularly repugnant tragedy in Beslan, North Ossetia in 2004, although the music’s ‘brief’ reaches somewhat further; indeed it pays homage to ‘all innocent lives lost in or beyond Iraq’. The soloist in what emerges as an oratorio for our modern age is here embodied by tenor James Gilchrist. This figure, worldly and unworldly (a Christ figure or ‘Everyman’ reluctant soldier, prophet), is propelled forward from a brief organ prologue and choral outburst and functions ambiguously throughout this ambitious musical setting. The protagonist’s closing lament, a salutary expression of grief following almost 90 minutes of thoroughly absorbing music, is ‘My God my God, why hast Thou forsaken me?’. ‘The Cloud of Unknowing’, which lies ‘betwixt thee and thy God’ remains elusive, ephemeral and ethereal to the last bars. The Vasari Singers under the baton of Jeremy Backhouse have an impressive curriculum vitae that spans some 27 years, a band of musicians clearly dedicated to the furthering of quality of British music: Vasari has commissioned and premièred nearly 20 important works in less than a decade, producing as many CDs. This disc seems likely to prove an apotheosis among apotheoses for Vasari, such is the prodigious care with which they tackle Pott’s passionate and apocryphal – or should that be apocalyptic? – masterpiece. Gilchrist carries his multiple identity with indomitable fervour, the luxury of his tonal resources securing Pott’s vision as unswervingly as the choir itself achieves. However, to describe the music as ‘moving’ somehow seems as unsatisfactory as to sum up the tragedies Pott evokes as ‘shocking’ : just a word. Rather, there is a meditative counterpart to this music, an experience which can really evolve only by taking it in a single hearing. Pott’s juxtaposition of Biblical fragments with texts by William Blake and Odysseus Elytis emerges as an entirely wholesome libretto, and the choir manages to clasp the image throughout, with Jeremy Filsell’s organ-playing sealing the textures with unshakable sensitivity. Particularly menacing in its fantastical design is ‘Is this He that was transfigured’, an amorphous musical space that might have been filled by Arvo Pärt just as readily, or perhaps even Herbert Howells. In fact, it is the calculated exploitation of that most indispensable of musical building blocks – absolute silence – that fixes these choral and solo events together so utterly convincingly. The choir is never more stirring than in ‘In one little time may heaven be won and lost’, a chilling yet strangely conciliatory entreaty that trickles forward from an unending musical breath. The sound-blend in this recording is never short of compelling, even in the more sinuous strands of music to be found in the passing of the penultimate ‘Amen’ from choir to soloist and back again, leading to ‘The love in him was such’. It was recorded in Tonbridge School earlier this year; the acoustic is sublimely appropriate and the organ colours wonderfully vivid. This is something of a tour de force for Francis Pott and Jeremy Backhouse’s Vasari Singers, and a disc of some distinction. Thus does Pott unashamedly nail his colours to the mast and become the latest in a long line of distinguished artists, performing and creative, who have used their art to make a political or philosophical point. There may be some who will disagree with the polemic I have just quoted. Maybe so, but most emphatically any such disagreement should not be a reason for ignoring The Cloud of Unknowing – for passing by on the other side. For this piece, I believe, is an important artistic statement, which carries a powerful humanitarian message that is of relevance to people of all political persuasions. Pott demands a huge vocal and emotional range – and great staying power – from his soloist but Gilchrist is equal to every one of the manifold challenges in the score. His voice is ideally suited for this music for it is essentially a light one, and so perfectly attuned to the many moments of intimacy in the score. However, Gilchrist has ample vocal power, when required, together with a touch of steel and so he’s more than capable of delivering the dramatic passages with bite. Whether singing quietly or full out his singing blazes with conviction at all times. I presume the music was written with his voice in mind; if so I suspect that Pott may have captured the essence of Gilchrist’s vocal persona pretty unerringly. I listened, enthralled, to this major addition to the choral repertoire. Last year Francis Pott’s was among my choices for Recordings of the Year and after hearing this marvellous, eloquent new release I’m sure history will repeat itself in 2007. Francis Pott: The Cloud of Unknowing – Muso - Both technically and emotionally the work is dauntingly demanding, but the Vasaris respond unflinchingly. The Cloud of Unknowing has much in common with Briten’s War Requiem both works are lengthy (Francis Pott’s opus is pushing 90 minutes), inveigh heavily against the iniquities of contemporary armed conflict, use a range of texts for the vocal settings and are unrelievedly stark in the musical representation of their bleak message. Easy listening this certainly isn’t. The piece is, however, treated to a magnificent CD debut here by the same team that premiered it a year ago in London. Vasari Singers is the choir that commissioned the piece and Pott creates for them a hugely testing series of scenarios to articulate, ranging from a setting of Psalm 137 (with its images of infant brains dashed against the stones) to the contrasting placidity of The Lord is my Shepherd, set for women’s voices alone. Both technically and emotionally the work is dauntingly demanding, but the Vasaris respond unflinchingly. There are two other major protagonists. One is a tenor soloist, intended by Pott as ‘an anthropomorphic presence: part Christ, part Everyman’. It’s a long part and constantly taxing but James Gilchrist delivers it with huge distinction. The other is Jeremy Filsell, whose virtuoso organ accompaniment is virtually never silent and plays a major role in what one commentator has termed this ‘meditation on the darkness at the heart of man’. In its original guise the medieval text known as The Cloud of Unknowing served as a guide to the contemplation of Christ’s goodness. Francis Pott, in his acclaimed commission for the Vasari Singers’ silver jubilee, provides a 21st century take on the dark soul of humanity. His Cloud conveys the almost unbearable reality of a world riven by fundamentalist ideologies, whether of the Islamist or global capatilist kind. Dedicated to ‘Margaret Hassan and all innocent lives lost in Iraq or beyond’, Pott’s monumental, eloquent take on senseless violence and shameful hypocrisy offers a shield to the spirit against those who would destroy it. Unmissable. Francis Pott: The Cloud of Unknowing – Gramophone - "...there’s no denying the commitment of everyone taking part." In anticipation of their 25th Anniversary (in 2005) the Vasari Singers commissioned pieces from 10 composers, among them Francis Pott, who produced a setting of Psalm 23. This consoling, meditative piece – conceived as a section of an extended anthem – subsequently developed into this oratorio which lasts an hour and a half. A clear indication of its themes for reconciliation and tolerance in a violent world and a condemnation of extremism can be found in the score’s inscription “To the memory of Margaret Hassan and all innocent lives lost in Iraq or beyond”. Pott combines Biblical texts (from the Four Horsemen of the Apocalypse to the Psalms) with William Blake and war poetry. One of the most chilling sections culminates in a repeated chant of the line “The dead are all on the same side”, a translation from the French Great War poet René Arcos. The Cloud of Unknowing is painted on a large canvas and there are times when the material seems over-stretched. The quicker, more dramatic choral music lingers longest in the mind. The choir’s interaction with the organ reminded me at times of Francis Jackson’s splendid (but largely overlooked) “dramas with music” Daniel in Babylon and A Time of Fire. Jeremy Filsell’s flawless playing draws numberless nuances from Tonbridge School’s Marcussen instrument. James Gilchrist is a passionate and occasionally volatile soloist: an irritating bleat creeps in when he really pushes the volume. Jeremy Backhouse and the mighty Vasaris give this uneven piece everything they can muster. It is worth persevering with. Francis Pott: The Cloud of Unknowing – The Sunday Times - **** - Passionate and precise. This work, written fort he excellent Vasari Singers’ 25th anniversary, deals with big things. Dedicated to Margaret Hassan “and all innocent lives lost in or beyond Iraq”, it is an extraordinary expression of Pott’s battle with ebbing faith, with a poignantly questioning setting of Psalm 23, written as a response to the Beslan tragedy, at its heart. Pott’s music is unapologetically conservative in style, but the tenacity and honesty with which he engages in self-debate is deeply moving, the humanistic interpretation of the Crucifixion as a symbol of the persistent suffering of Everyman tenable for people of all faiths and none. This performance is both passionate and precise, with magnificent contributions from Gilchrist and Filsell. Francis Pott: The Cloud of Unknowing – The Observer - This latest example is an immensely moving oratorio for tenor, choir and organ. The enormously gifted Vasari Singers and their visionary conductor Jeremy Backhouse have made unparalleled efforts in recent years to revitalise and replenish the modern choral repertoire. This latest example is an immensely moving oratorio for tenor, choir and organ, written in response to worldwide conflict generally but particularly to the 7 July London bombings. Pott chooses texts from the psalms, Blake, war poets and mystical tracts to illustrate mankind’s capacity both for cruelty and self-sacrifice, setting them to music of great power and beauty.